Forested escarpment of the Rift Valley in the Lake Naivasha region, Kenya. 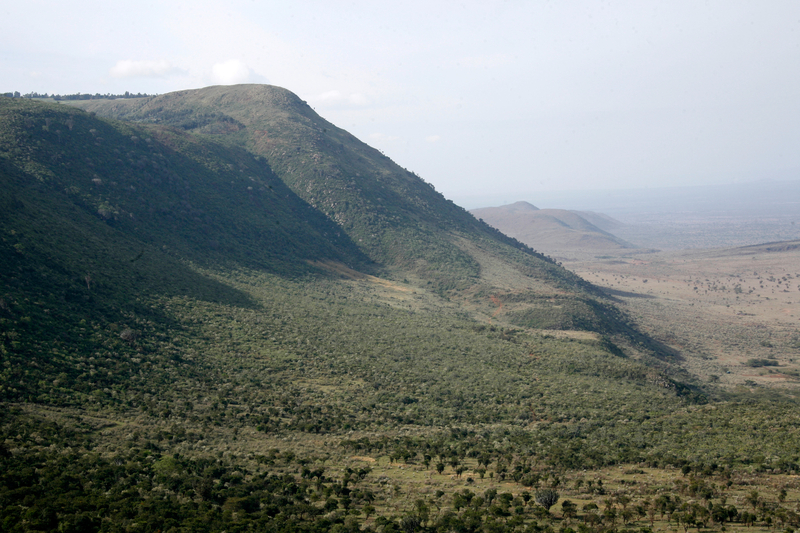 The Lake Naivasha Basin hosts sections of Kenya’s five water towers, the Aberdares and Mau Forest Complex. In addition to being a fundamental water source, the basin also host Lake Naivasha that supports a flourishing business in the horticulture industry. Despite this incredible importance, the landscape continues to experience immense negative impacts due to human related activities including deforestation. To tackle this challenge, WWF-Kenya is implementing the Lake Naivasha Basin Reforestation Project, an ambitious initiative that aims to establish 1,000 hectares of new forest area by 2020. This project is registered under the Gold Standard funded as an insetting project by Coop Switzerland. Leveraging on a multi-stakeholder approach the project engages commercial flower growers and smallholder farmers to not only promote new tree growing but also rehabilitating natural vegetation and improving water resource management. Currently the project has recruited 705 farmers. 183 farmers these farmers have already been trained on forest management systems and the requirements of the Gold Standards. total of 261 Ha ready for planting in FY 18. Jonathan Muya, Chairman Friends of Kipipiri Water Towers said, “Through the project we hope reduce pressure on natural forest at Kipipiri Mountain; as communities will now have enough fuel from the woodlots.” He adds that with improved tree cover, farmers in the Lake Naivasha Upper Catchment will also have improved farm yield due to controlled soil erosion and thus improved livelihoods. According to John Kihiu planting trees is his trifling contribution to reducing carbon footprint and improving the country’s forest cover. He argues that improved tree cover will help improve bio-diversity and in turn, communities will benefit from other forest products such as bee keeping. Kihiu and his wife (Ruth Wanjiru) have been managing a tree nursery for the past 15 years as a business venture. From this business, he has been able to school three children and built a permanent house. In the first phase of the project, Kihui plans to plant 4500 pine seedlings. Anne Wanyoike Treasury Aberdare CFA, adds that the Carbon Credit Project will go a long way to tackle the quality and quantity water challenge in Lake Naivasha Basin; that is occasioned by soil erosion from the farms in the steep slopes in the upper catchment.